A little over 2 weeks ago, on June 8, I completed my first distance event since physical therapy, and it was awesome! Well, the event was awesome! My performance was a different story, but that was expected. This is the only road race sanctioned by the US Navy. I went into the event almost completely untrained, and logic would say that I probably shouldn’t have even done it at all. However, I wanted to do it, and so I decided to throw caution to the wind and went with the school of thought that it’s better to be under-trained and healthy than be over-trained and injured. I decided I would run/walk as far as I could then just walk the rest. I was confident I could finish without further injury by using this strategy, and I was right. Before going forward, I will say that I don’t recommend this. I don’t want anyone reading this thinking to themselves, “if she can do an event untrained then I can, too!” Please keep in mind, I have trained for and completed several half marathons so I know how to hydrate, fuel, and pace myself. I do think this is more than half the battle. Training is more than just getting yourself physically ready. It’s also practicing and experimenting with hydration and fuel so you know how to keep yourself going. I know what works for me because I’ve spent a lot of time figuring it out. Now about the event. I really wanted to do this event last year. Unfortunately it was cancelled due to the government sequester. 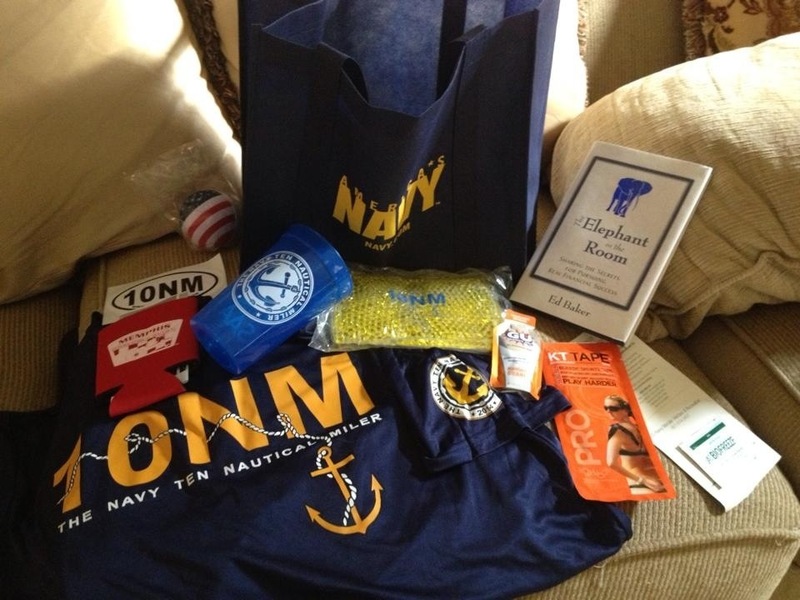 It is presented by the Navy, just like the Marine Corps Marathon is presented by the Marines. While I don’t know all the details, the government cutbacks meant last year’s event had to be cancelled. So, I was thrilled to learn it was on for 2014! 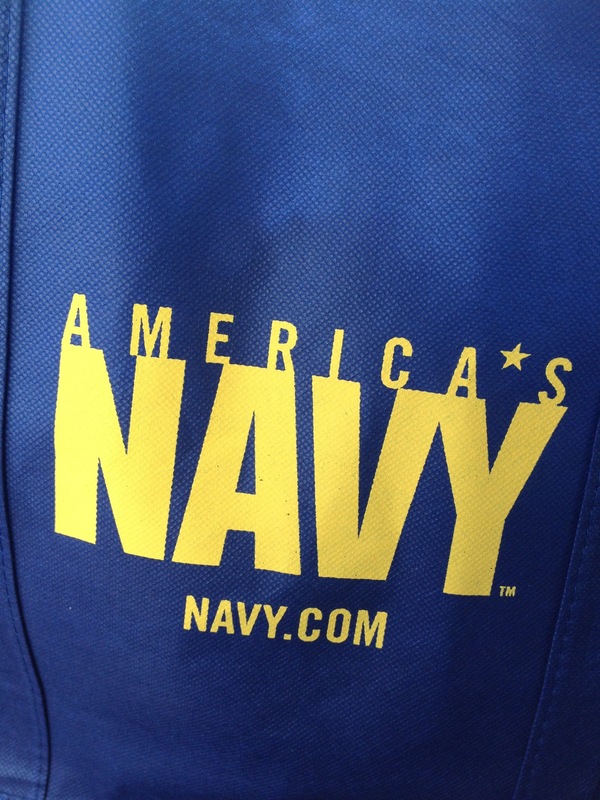 On Saturday, June 7, I went to packet pickup, which was held in the gym at the Navy base in Millington, TN. I was expecting a normal packet pickup but when I got there, I found more of an expo set up. 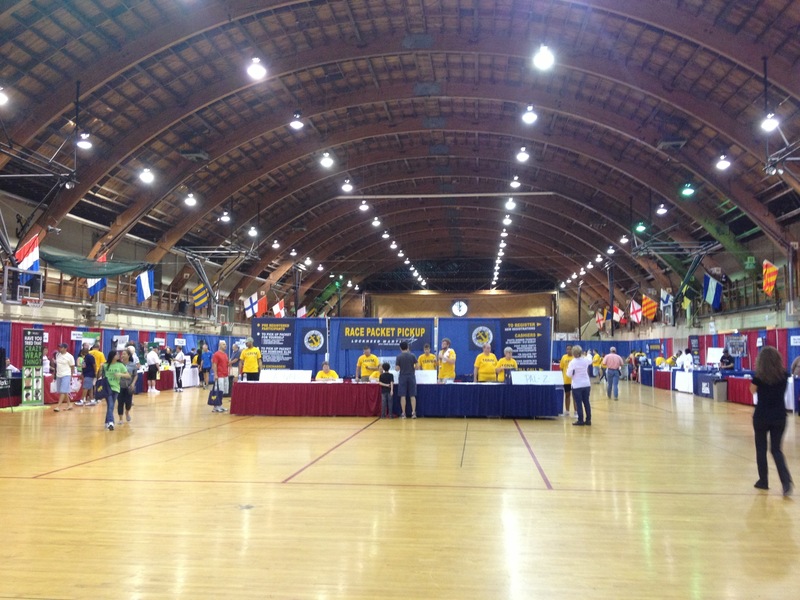 I expected a small packet pickup but found an expo instead. There were several vendors and swag was plentiful! Just from the vendors I got a tech shirt (not the race shirt), a fan, a pocket notebook, a thing to hold small items and hang around your neck, a plant, and a sweat towel. Also, this does not even put a dent in all I could have gotten, but I only picked up things I thought I would use. The official race swag came in a reusable tote, which contained my race bib, race tech shirt, event sticker for my car, koozie, cup with race logo, hot/cold pack with race logo, a motivational book, Gu, KT Tape, and Biofreeze. 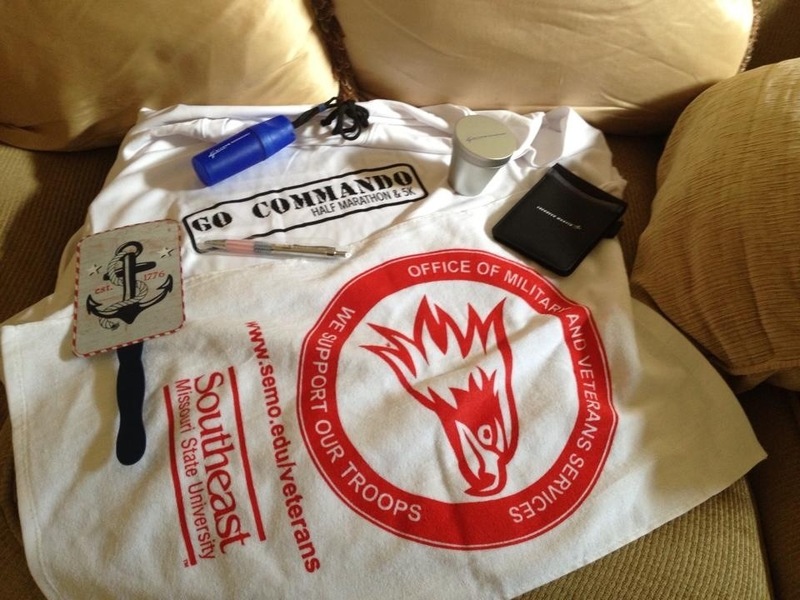 This was by far the most generous goody bag I’ve ever gotten from a race and really set the tone for the rest of the event. On Sunday morning, I left my house at 5 am for a 6 am start. We had to line up 15 minutes early so the Captain could address us. He explained the significance of the event, which I could create an entire story on. The short version is that this event is the only road race measured in nautical miles (10 NM = approximately 11.5 land miles). At sea level, 10 NM is the distance to the edge of the horizon. Also, 10 NM is the distance the Allied Forces traveled on D-Day. 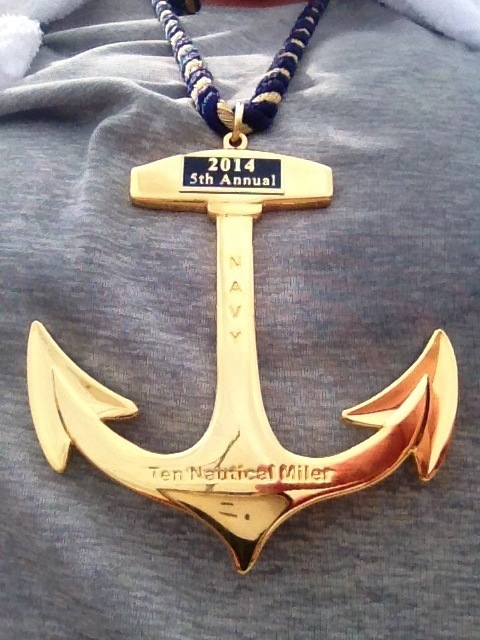 The first Navy 10 Nautical Miler was held on D-Day in 2010. After the National Anthem and the Captain’s address, the wheelchair division got their start. Before long, we were off, too! The weather was gorgeous, mild and overcast. It was a perfect day to run. The course was beautiful, too. We went around a golf course, through some rural areas, residential areas, and through the base. I saw horses, and even a live skunk within spraying distance. Luckily, it left me alone. Course support was plentiful! They had water and Gatorade at every nautical mile. There were orange slices at 2 of the stops, and about halfway through, there was even a beer stop (not official). In the residential area, neighborhood kids had their water guns, giving sprays to whomever wanted one, which was a fun touch. It definitely took me much longer to finish than it would have if I were well-trained. I walked most of it, but I did finish in relatively decent shape. I was so excited to get my finisher medal! I was thrilled to earn my anchor! I had been waiting a long time to earn that anchor. I was also handed a cold towel, fresh from the cooler, right after getting my medal. I think that was the most refreshing thing I’ve ever felt! The post-race party got high marks from me, too. Food was plentiful! Beer was freely flowing, and water and Gatorade were in abundance! I also saw chocolate milk available, too. Food items I saw included chicken and biscuits, macaroni and cheese, breakfast potatoes, pizza, waffles, and Krispy Kreme donuts. Overall, this was one of the most well-run local events I’ve done. I enjoyed every aspect of it, and I hope to have the opportunity to do it again next year and redeem myself. Don’t forget to enter my Coppertone Clearlysheer sunscreen giveaway! Click here for details on how to enter. This was one of my favorite events that I have ever participated in! Great recap. Mine, too! Thanks for reading! I’m so sad I didn’t do this one – it’s definitely on my list for next year! For sure do it, Kristen! It’s a good one!